Rich Faul submitted this photo and caption. 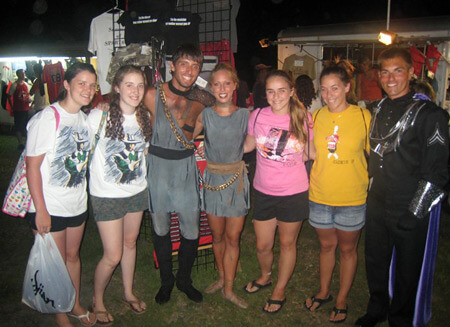 I took this photo in the souvenir marketplace area at the 2008 DCI Eastern Classic in Allentown, Pa. My daughters Sami and Alex (on the right), along with their friends Emily & Kristen (on the left), made some new friends from the Phantom Regiment. During our visit, I told Phantom's drum major that the last time they played "Spartacus," I was marching as a member of the Bayonne Bridgemen. That year, 1981, Phantom beat us out of fifth place by .05 at the DCI Finals. Wow, just 27 years ago!